KIEV, Ukraine -- As Ukraine is struggling to reform and survive during war, it is relying on a cohort of accomplished foreigners for leadership. 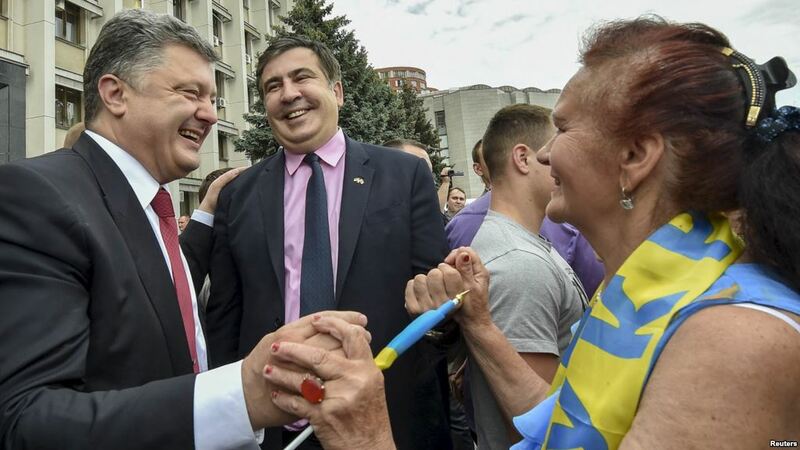 Ukrainian President Petro Poroshenko (L), and former Georgian President Mikheil Saakashvili, who now is governor of the Odessa oblast, are greeted by a local resident near the regional state administration in Odessa, May 30, 2015. For example, foreign-born ministers are negotiating a way out of Ukraine's debt burden, and former statesmen from Georgia are at the forefront of Ukraine's fight against corruption. Ukraine has an ancient tradition of being supported by foreign talent, said Alexander Motyl, professor of political science at Rutgers University in the U.S. state of New Jersey. "The most spectacular example of foreigners contributing to Ukrainian history is the Varangians [vikings], who established the Kievan Rus state — considered to be a distant predecessor of Ukrainian statehood — in the ninth century," Motyl told VOA. At present, the most prominent foreign reformist in Ukraine is former Georgian President Mikheil Saakashvili, who was recently appointed governor of Odessa oblast. This province stretches along the Black Sea in the country's southwest and is known for its ethnic and cultural diversity — and deeply rooted traditions of corruption and smuggling. Saakashvili has already embarked on ambitious anti-corruption reforms. Denis Kornyshev, chief editor of 368.media, an anti-corruption project in Odessa, told VOA that locals appreciate Saakashvili’s openness. The governor is eager to pose for selfies and moves around the city without bodyguards. While Saakashvili had to flee Georgia in 2013 after his party lost parliamentary elections and he was barred from seeking a third presidential term, Ukrainians seem to care most about his record of reform. Erekle Urushadze, program manager at Transparency International Georgia, told VOA that under Saakashvili, Georgia made “outstanding progress” in terms of fighting corruption and broader administrative reforms. "In our Corruption Perceptions Index, Georgia moved from 123rd place in 2003 to 51st in 2012," Urushadze said. However, it's not solely Saakashvili's achievements that fuel his current star status in Ukraine. The country's post-Orange Revolution president, Viktor Yushchenko, had a friendly relationship with Saakashvilli. They skied together, and Saakashvili was heaped with praise in Ukraine's media. The challenges facing Saakashvili with regard to Odessa are grave. Odessa was a site of deadly clashes between pro-Ukrainian and pro-Russian protesters last year and has recently become a target of bomb attacks allegedly perpetrated by the pro-Russian underground. To the west, the region borders on unrecognized Transnistria, which hosts a sizable garrison of Russian troops. Saakashvili, who presided over Georgia's 2008 war with Russia, should be fully aware of the dangers of such a neighbor. Olena Dobrovolska, a popular journalist in Odessa, told VOA that in order to succeed, Saakashvili will have to take on a well-established corrupt local elite and the region's population of Russia sympathizers. Lack of ties to Ukraine are seen both as an advantage and threat. Some critics dismiss Saakashvili because of his ethnicity, Dobrovolska said. One of the most vocal critics of foreigners in the government is Oleh Lyashko, an outspoken member of parliament who finished a distant third in the 2014 presidential election. Lyashko recently took a swing at foreign officials in Ukraine by mixing up their last names with profanity. In an interview with VOA, he stated that his Radical Party champions a top-to-bottom purge of the state apparatus. He doubts foreigners are accountable to Ukraine. "If they fail, they'll board a plane and leave ... and it's us Ukrainians that have nowhere to go. It's our land and we have to fix it by ourselves. No one will help us, if we won't help our own selves," Lyashko said. Where Lyashko sees a lack of ties to Ukraine as a shortcoming, others see a benefit. "They're not included into any of Ukraine's major financial and political groups and therefore able to champion the interests of the Ukrainian people," said Svitlana Zalishchuk, head of the Ukrainian parliament's subcommittee on European and Euro-Atlantic integration. Zalishchuk also said experienced foreigners are bringing virtues that are scarce among Ukraine's elite, like honesty. "Honest and competent individuals, regardless of age or ethnicity, are still a minority in Ukraine's power structures," Zalishchuk told VOA. Saakashvili's methods in his native Georgia both enabled the country's transformation and led to his eventual downfall, according to Urushadze. For instance, he said, extreme consolidation of power led to abuses by the executive branch and law enforcement. While there is no evidence that Saakashvili personally gained from corruption, some forms of it persisted. The prosecutor's office was involved in unlawful seizing of private property, and Saakashvili's party and some members of his team benefited from suspicious dealings, Urushadze said. "Former Defense Minister Davit Kezerashvili turned into a wealthy and influential businessman shortly after leaving the government. A 2011 report by TI Georgia found that he controlled almost the entire advertising market in Georgia through a network of interconnected companies," Urushadze told VOA. VOA has reached out to Saakashvili’s office for comments. In the meantime, Odessa locals are waiting to see if his efforts bear fruit.